Up an away: I'm at it AGAIN!! just wondering if you scrap more than one picture on a layout. if not do you every try to do a different size than 4x6? Actaully I usually never do just one picture!! Ha Ha. I'm trying some new things and it's just what worked I guess. I love to use really really big pictures like 8x12. I'll do one tonight and post it tomorrow!!!! 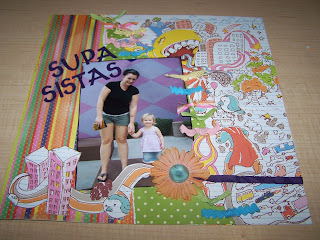 But usually my layouts have lots of pictres on them, and lots of different sizes. I like that the papaers are so busy. You used them well.